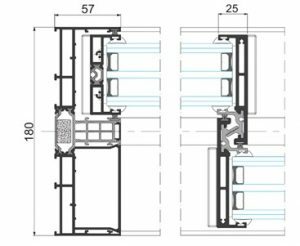 Simple sliding system which is specifically designed for large dimensions. 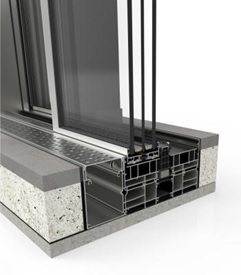 By minimising the visible area of the aluminium, the system allows more light to pass through. This is due to the fact that this system allows you to have a 94% glass surface. This system allows you to place glasses of up to 54mm thickness which assures you with minimised heat loss and great sound proofing, due to the great glazing capacity of this system. It is only suitable for fixed and sash windows and doors (2&4 sashes), with a maximum dimension of 4000mm for both width and height. This system only has a visible section of 25mm giving it the option to lay the top, bottom and sides flush with the surface around it. You have the option of having a motorized opening for weights of up to 700kg or a manual opening of weights up to 400kg. For your security we can include a multipoint lock system by an operating rod, with or without a key depending on your request. Rollers are placed in the frame, with the sashes having a stainless steel reinforced channel which allows you to open the window/door as smoothly as possible. 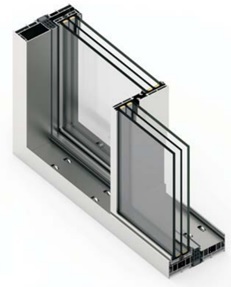 Traditional perimeter frame with 45 degrees cut and straight cut in sashes allows for easy disassemble, allowing the user to easily replace broken glass.